Gorgeous mosaic and beautiful flowers! I fully understand, Mary! I usually love autumn, but this year I have been lucky to enjoy summer temps and beauty a little bit longer through some trips. Glad you got your back! That was one surprise storm! Mary this is absolutely beautiful and should be an inspiration to so many readers. Glad that things are back to normal at your Little Red House! Such a burst of colour after your town's white-out of last week.....a real treat. Mary, this mosaic is breathtaking!! Thank you hosting this wonderful Mosaic Monday! Glad to see you back. Your mosaic is pretty and feminine, a lovely change from leaves and pumpkins. I love your look back a summer's bounty. It was amazing how hard hit some areas were by last week's storm. Glad you have power again! A flower of every colour for any occasion, they're pretty Mary. I can see why they are in your flower favorites. Gorgeous! Happy to hear things are returning to *normal*. Perfect. I am in need of beautiful flowers too. I brought home a fresh flower bundle to enjoy this weekend. Beautiful colors, similar to your mosaic. Beautiful, thanks for hosting MM. Mary, I definitely understand about overload of pumpkins -- and especially love your mosaic this week! Stop by if you get a chance and check out The Sally List! just what I needed, a bouquet of flowers, Thanks! Such a cheery mosaic ... enough to lighten the heaviest of spirits. I can relate to the no electricity saga. Here in Southeast Texas, we live close enough to the Gulf to endure hurricanes, which usually means we are without power for some time. The last one I recall as a "bad" one was Hurricane Ike a couple years ago. We were without electricity for 12 days in a row. Not fun, but at least we weren't cold. What a lovely post Mary! Thanks for sharing! You succeeded well in your goal to make a cheerful mosaic, Mary, and I'd want to do the same after a period without power (they happen now and then during typhoon season in Manila, too). Your mosaic made me smile. I have no flowers in my garden at the moment so to see such a pretty mosaic is bliss. Hope you find some pretty flowers to photograph. I am going to do the same. What beautiful flowers. So nice to see such lovely blooms when most of my flowers are gone. Each photograph is beautiful in your lovely mosaic for today. It's so cheery to see all the lovely flowers peeking through your mosaic. I love all the beautiful photos in your mosaic! Ah, Mary, I love all of the beautiful flowers! What cheer they do bring....The shots are so lovely that you can almost smell each one of them. Your winter has already starting off rough, so we understand that you need some color and cheer. I do understand the "girly" thing!! Mary, what beautiful flowers!! I love the pretty cool ,soft colors. Delightfully cheery. Actually, I've gone to my local grocery floral dept. on several occasions, too, and took photos. I've gotten some lovely pictures. And last evening I treated myself to a pink rose bouquet. They were on sale, and I can't wait to put them in my newly acquired thrift find, lead crystal vase. I'll be sure to take photos. Good morning Mary, Lovely flowers! I have gotten off to a rough start so far. I typed my blog address wrong and so therefore my name is there twice. I am curious and wondering if there is actually a way to go back once it's been done. So the sunny smiles is me but from an old blog...We had a wild evening last night with a lot of thunder. The cats didn't know what to think. Quite unusual for sunny California. Have a wonderful day! 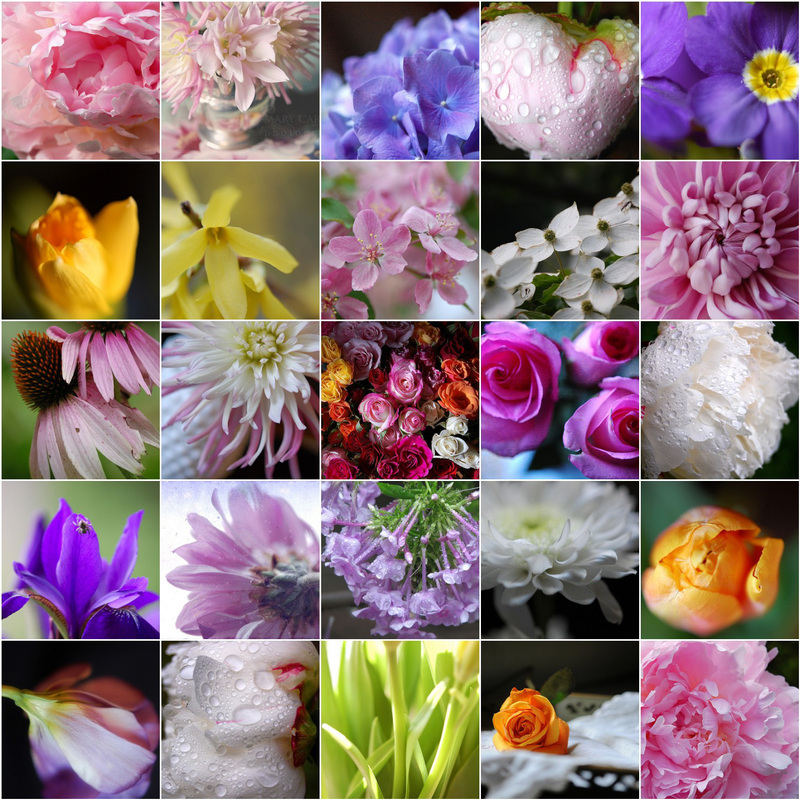 glad i found this blog, and it's my first to join...beautiful set of flowers on your mosaic. have a wonderful day. You can't know how much your lovely nature and flower photography has inspired me and improved my own. Your photos are so lovely and show someone who truly loves the subject of each photo. I definitely do understand. And, the mosaic speaks of beauty. Love it. I'm glad you are up and running again. So glad that your power is restored. That would be difficult. Missed being able to link up last week. Love, your flower mosiac. Definately cheery! I have some acquaintances in CT who STILL don't have power! I can't even imagine going through that! 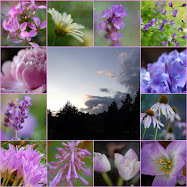 LOVE the flower collage -- and I'm so sorry you lost power. Yes, you don't really appeciate electricity until you don't have it. We were crazy lucky -- our small neighborhood was an island of light in the blacked out darkness. Just around the corner from us in all directions -- including Route 46 -- was in the dark. Our lights briefly flickered once, then again -- and then stayed on. Just like in Irene. I feel I have to knock wood when I say that. Perhaps the only upside of being power-less is that you don't have to vacuum. Mary, do you remember those tremendous ice storms that we had a few Decembers back? My MIL and husband were out of power for two whole weeks BUT we were out of power for four days - right at the winter solstice. It was so dark! and, I had the same thought as you, as we had our candles lit on the mantelpiece and had to haul water from the pond to flush our toilets (we were new in the house and didn't have a generator, yet!) We were homebound and had to find a way to keep warm and entertain ourselves in the long dark winter evenings. What must it have been like? and, once upon a time, not too long ago, really, in the very room that we were in - that's what it was like - if the walls could speak! oh, and your mosaic... it's so refreshing! I came before when it was new and just soaked it in but I don't think I ever left a comment.